A Journal of Affirmation / A Monthly Journal of Positive Affirmations, Devoted to Mental Science and the Art of Living / The Biggest Little Paper in the World. San Jose, CA; Glenwood, CA. Publisher: Now Folks. Editor: Captain Henry Harrison Brown, founder and editor; then Sam Exton Foulds. Suspended November 1906-December 1909, during which period Brown published in the New Thought and advertised in the same journal for "a gentleman with capital" to assist him in re-establishing this journal. $1.00 a year. 8- pp. This was the premier New Thought journal of the "Dollars Want Me" (the title of one of Brown's books) school. Devoted to Affirmations ("All is one; That One; That One is all things; I am a manifestation of the One; I possess Power to do all and enjoy all," etc. ), suggestion and optimism. In its heyday before World War I, the journal printed 24 pages of instruction and uplift, supplemented by 12-24 pages of advertisements--at $2.00 a line. Advertised in The Free Man, August 1901: "Devoted to the New Thought, teaches the art of gaining health, wealth, happiness, and business success, by right thinking." Noted scathingly in Upton Sinclair's Profits of Religion (1918). Horatio Dresser in his A History of the New Thought Movement (1919), 239, says this was the "most vigorous" of the New Thought journals and describes its message as follows: "Man is spirit here and now, with all the possibilities of Divinity within him and he can consciously manifest these possibilities here and now." Brown, in his New Thought Primer(1903), 54-55, calls this "a leading New Thought journal, carefully edited, outspoken and fearless, yet ever kindly," and says that the journal contained in each issue a lesson on Soul Culture, a series of Affirmations, editorials, selections from other journals and "dialect poems" by Sam Exton Foulds. University of California, Berkeley; LOC; University of Michigan; University of Cape Town; San Francisco Public Library; Harvard University; International Institute of Social History, Netherlands; Brown University. Announcement from San Francisco, Ten Days after Memorable Earthquake and Fire. 1906. 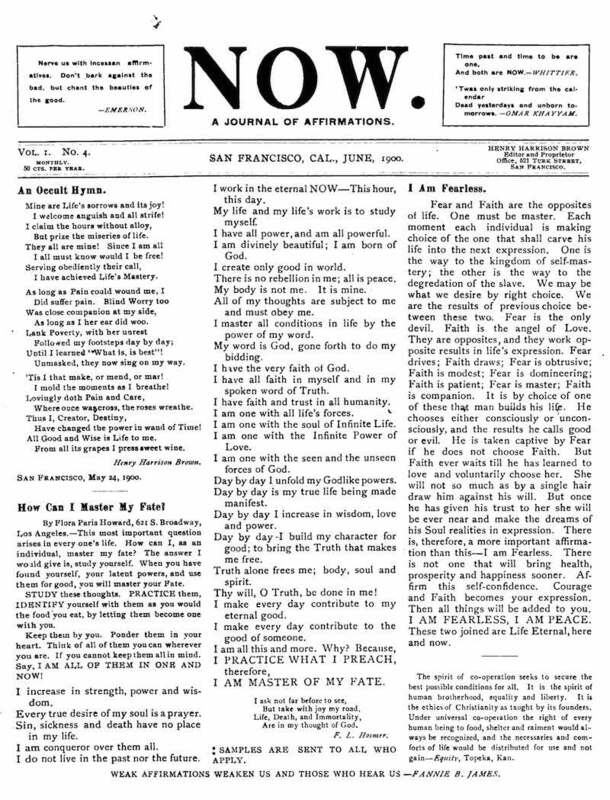 This began as a 9 x 11 broadside subscription announcement for Now: A Journal of Affirmation, and proclaimed itself to be the first magazine printed in San Francisco after the earthquake. The appeal apparently did not work, and Now (q.v.) remained suspended until 1909. Harvard University.